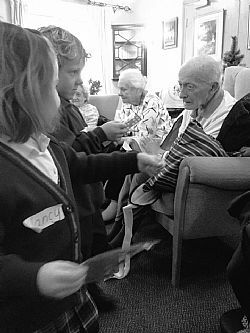 At the end of November, the residents of Claremont Lodge Care Home welcomed some very excited young children from Chichester’s Great Ballard School for an afternoon of arts, crafts and treats. The local children from the School’s Nursery and Reception were eager to get on the coach to make the five-minute journey to the care home near Arundel. The residents from the retirement home in Sussex had a delightful afternoon of puzzles, games and stories followed by a magical performance from the School’s young choir. Claremont Lodge Care Home are looking forward to another lovely afternoon of entertainment in December when Great Ballard School will play host to the nursing homes Chichester residents and perform their nativity play to them.